Beta Analytic’s company leaders and lab managers have extensive experience on radiocarbon dating. Sample size matters when choosing the appropriate radiocarbon dating technique. The company has been the world leader in radiocarbon dating services since 1979. Each analysis is provided with consistent accuracy and attentiveness to clients’ needs and concerns. Beta Analytic’s biggest advantage over low-cost university competitors is its fast turnaround time – 14 business days or less. Beta Analytic’s core business is the radiocarbon dating of geological, hydrological, and archaeological materials. The company also measures the radiocarbon content of biobased products, biofuels, and gas combustion emissions according to the ASTM D6866, EN 15440, CEN/TS 16137, and CEN 16640 standards. Majority of Beta Analytic’s clients are from universities, government agencies, and environmental companies. Murry Tamers, Ph.D. (Yale University), D.Sc. (Universite de Paris Sorbonne) and Jerry Stipp, Ph.D. (Australian National University) founded Beta Analytic, Inc., in 1979. They have both been instrumental in the development of radiocarbon dating as a method since 1959 and have published more than 100 papers on radiocarbon dating, geochronology, and hydrology. They formed Beta Analytic as a dedicated professional radiocarbon dating lab able to routinely provide accurate radiocarbon dates within a timely manner. Today Beta Analytic is headed by Darden Hood, President, and Dr. Murry Tamers, Chairman. Mr. Hood joined Beta Analytic as a geochronologist in 1980. Deputy directors Ronald Hatfield and Chris Patrick, who joined the company in 1981 and 1985 respectively, manage the labs. With their extensive experience in all aspects of radiocarbon dating, they supervise a team of professional technicians and ensure that quality control is maintained at all levels. Why does quality assurance matter in radiocarbon dating?Disclaimer: This video is hosted in a third-party site and may contain advertising. The AMS instruments are the newest state-of-the art technology designed specifically for radiocarbon measurement. Beta Analytic currently owns multiple accelerator mass spectrometers, each capable of 25 to 30 sample analyses per day. Each instrument has two SNICS (Source of Negative Ions by Cesium Sputtering) ion sources. The redundancy best ensures constant throughput since the SNICS is the major source of downtime in an AMS. The company also has a substantial supply of spare parts, especially those that are prone to failure and/or have extended repair times. Sequential injection of Carbon-13 and Carbon-12 provides for measurement of Carbon-13/Carbon-12 ratio within the instrument, necessary for accurate total fractionation correction without relying upon relative measures and assumptions (something some older machines are limited to). Sequential injection of Carbon-14, Carbon-13, and Carbon-12 allow for calculation of age both using Carbon-14/Carbon-12 and Carbon-14/Carbon-13 ratios. Simultaneous accumulation of the Carbon-14/Carbon-12, Carbon-14/Carbon-13, and Carbon-13/ Carbon-12 ratios ensure ongoing quality control during the detection; the calculation of each provides three different measures to ensure isotope pathway is stable during the analysis. In addition to measuring the Carbon-13/ Carbon-12 within the AMS (correction for total fractionation to derive the most accurate conventional radiocarbon age/pMC), the sample’s Carbon-13/ Carbon-12 ratio is also analyzed in an isotope ratio mass spectrometer. Beta Analytic has access to two in-house Thermo-Finnegan Delta Plus Isotope Ratio Mass Spectrometers, each capable of 70 measurements per day. Two machines are on the premises to ensure redundancy and constant throughput. Multiple parameters are tested for each sample before accepting the data. This includes, but is not limited to, cathode current, extractor current, cesium focus current, high-energy Carbon-14/Carbon-12, high-energy Carbon-14/Carbon-13 ratio, low-energy Carbon-13/ Carbon-12 ratio, low-energy Carbon-12 current, low-energy Carbon-13/ Carbon-12 current, and gated Carbon-14 counts. Once accepted, ratios between and within the Oxalic Acid modern standard are utilized to calculate a fraction of modern value for the unknown. 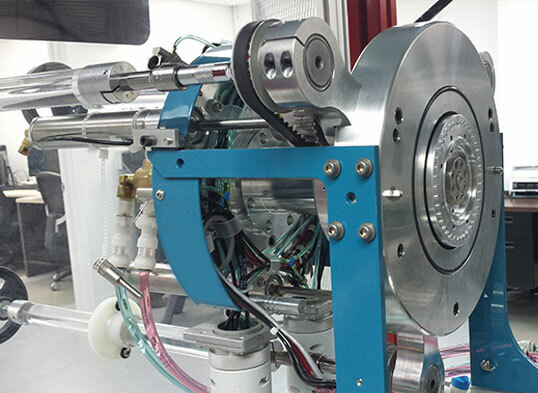 At least two background measurements are made at the beginning and end of each run to ensure the absence of any contamination between sample wheels. Six modern standards are measured and 4 to 5 known-age QA standards are run in each wheel to ensure accuracy in the results for the unknowns. Why is it important for a radiocarbon dating lab to be tracer free?Disclaimer: This video is hosted in a third-party site and may contain advertising. Measurement of the Carbon-13/ Carbon-12 ratio allows for correction of the measured Carbon-14 age based on the amount of isotopic fractionation (enrichment or depletion) in the individual sample as compared to the modern standard. If the measurement is not made, one is assumed in the age calculation. For identified materials, this estimate can be very close to the measured value. However, it is especially important for unidentified plant materials that may contain a mixture of C3 (e.g. typical hardwood trees) and C4 (e.g. corn) pathway plants and CAMS pathway plants (e.g. yucca), which could result in a 250-year error in accuracy without the measurement. It is important for bone samples since it will give insight into the purity of the protein extracted for radiocarbon dating analysis.